Two opposite views on the rise of China: From Thomas P. M. Barnett and Gideon Rachman. We seldom delve into political matters here, at least U.S. domestic ones, and let's keep it that way. Yes we'll criticize China and Burma and North Korea, but based on the way they treat their people, they richly deserve it. But reading the current Foreign Affairs makes me throw up my hands. In a special edition focused on "The World Ahead," a who's who of veterans of the American Thinking Establishment scolds the U.S. for its proflicagy. Richard Haass, who was for the Iraq war before he was against it contributes a primer on "The Consequences of Fiscal Irresponsibility" as if none of us has been reading the papers and we were all just waiting for him to weigh in. (See also Ken Pollack of the Brookings Institution and Iraq.) Les Gelb explains "The Primacy of Economics" as if he's known it all along, but just waited until now to explain it to us unwashed. These people make it their paid job to advise the wise and explain it all to the hoi polloi. Some advice to the wise along these lines might have been more useful before the September, 2008 collapse of Lehman Brothers, and surely prior to the November/December 2010 edition of Foreign Affairs. Don't you think? This kind of establishment group-think has gone a long way toward getting us where we are now. It argues for more alternative thinking, sort of like the original thinking of Andrew Bacevich and Chris Hedges, to name two. Ian Bremmer has written a thinking book about the state of relations between states today. This issue of Foreign Affairs, meanwhile, reads like all their leading lights have known about this coming calamity all along, of course, and will now deign to explain what it all means. Foreign Affairs is published by the Council on Foreign Relations, as establishment an organisation as we have. Its "board of advisors" includes Fouad Ajami, Tom Brokaw, Jim Hoagland and Colin Powell, among others, who represent as establishment a group as there is in this country. They've spent the current issue sagely explaining what, if they were earning their money, they'd have helped to prevent in the first place. Safaris Are a Top Goal for that "Trip of a Lifetime"
We've waxed editorially about the overuse of the marketing words "of a lifetime" a couple of times. Now Alexia Nestora, who runs a blog called Voluntourism Gal, has published a study that gets past the marketing to have a look at what people really decide to do when they take what they describe as their trip of a lifetime. Key finding: "70% of respondents said they are most interested in visiting natural and man-made wonders on a once-in-a-lifetime trip such as Machu Picchu, the Pyramids or Victoria Falls. Beyond that, 53% said they were very interested in going on safari...."
Also: "52% of respondents organized their lifetime trip independently, 18% join a tour group, and 16% use a travel agent to organize their trip." Have a look at her summary, or download the whole report. And, I'd add, from reliving the experience with your photos after the trip. I guess it’s meant with the best intentions. But, how to answer? Do they really want to know? If it comes from somebody you talk with regularly, it could be just a way to say, hey, we haven’t talked in a few weeks, and it would be strange to pick up where we left off without acknowledging your absence. That’s what I do anymore. Not literally give a one-word answer, but just reply with something breezy like, “Oh, great. It was a grand and sprawling adventure.” And if THAT doesn’t generate a follow-up question, they don’t want to know. For the longest time I made the mistake of thinking people did want to know. I was so proud of our having traveled over the Himalayas from Kathmandu to Lhasa that I was insufferable bursting to share all the noodle slurping thrills. But some people just don’t care. Others think you’re kind of weird going off all that way. There will be some who steer you away with a non-sequitur like “My uncle spent six years in China.” These people are embarrassed they couldn’t find Kathmandu or Lhasa on a map. Once in a while, somebody will have done something equally fabulous and they will be a pleasure to talk with. With those people, just let the whole thing slide. For my part, I travel not to go anywhere, but to go. I travel for travel’s sake. A long time ago, when there were still independent bookstores, I found some little tour books about Soviet cities – Leningrad, Moscow, Kiev – published by the Novosti Press in Moscow. I still have them today. When I see the odd travel guide to an offbeat destination like Yemen, say, or Gabon, I buy it without even opening the front cover. Far away places are just plain alluring, and the more exotic the better. But how to find out about them? Lots of travel books detail the author’s vast, grimly accumulated knowledge of this or that historical oddity, and sometimes it’s only tenuously connected to the traveling they’re actually doing. Lengthy explanations of 14th century funerary rites in Assam, or the surprising mating rituals of arboreal reptiles can grow quickly tedious – and I’m pretty sure it’s not just me. And on the internet, let’s face it: Nobody cares what Phil and Jenny paid for every hotel room in every town in Andalusia (converted to dollars, to the penny), and nobody wants to read the loving list of every dish at every meal Mr. and Mrs. Kincaid enjoyed on this, their seventh trip to Kerala. I want to know what I’d find if I hopped aboard a flight somewhere. What’s it like right now? Since my first meek little trip off the continent, to London in 1984, I’ve poked around odd parts of the planet, mostly with my beautiful wife Mirja, an intrepid Finn I met in Helsinki. Jeffrey Tayler says that to stay young, we need novelty in regular doses. Within the constraints of our day jobs, Mirja and I have seen little snips of places that previously existed only in books, from Greenland to Madagascar to Papua New Guinea, to Albania just after it threw off totalitarianism. The stuff here on Common Sense and Whiskey may not always be steeped in history or detail. Sometimes it's more about the trip than the destination, and sometimes the other way 'round. I hope some of the stories make you feel how it felt to be there. In any case, I’m pretty sure everything here is sufficiently unencumbered by ponderous history and unnecessary tram schedules. When a Crocodile Eats the Sun: A Memoir of Africa. This photo is of a thriving downtown Harare in 1995. I remembered Harare fondly as a friendly city that worked, so I went back and found some of the things I wrote while visiting there, and to reread them today against the backdrop of those headlines is just astonishing. The light was so pretty as we left Novy Beograd, crossing the Sava River bridge, that when traffic backed up, I jumped out of the cab and ran to the median to take this picture looking downtown. While I was out there the taxi edged ahead of me and before I knew it, my wife and our friend Gordana came into view along the sidewalk. They had paid the cabbie and let him go. Trouble was, I had left a bag with a telephoto lens on the seat, and I didn't tell them. This was spring of 1997, during the long, slow suspended-animation fall of the Milosevic regime. Douwe Osinga, who created a customizable Visited Countries Map (ours is shown), writes in defense of colonialism. We've written recently about our visit to the Congo border at Goma, and previously about the plight of the mountain gorillas in Congo. Now comes a new story, Mountain Gorillas at Mercy of Congo War Factions, on Reuters Africa. It's such a confusing and sordid situation that, with allegiances shifting, neighboring governments involved, mineral wealth at play and wounds still open from the 1994 Rwanda genocide, it takes a scorecard to sort out the battle lines. But the conflict gives every indication of escalating yet again. The leaders of Congo and Rwanda, Laurent Kabila and Paul Kagame, declined to seize an opportunity this week, speaking only briefly with one another when they were both in Nairobi for a summit, suggesting a test of strength is ahead before real negotiations begin. Meanwhile Portuguese is now heard among government soldiers in eastern Congo, suggesting the introduction of Angolan troops as sought by Congo. The Southern African Development Community said it would send military advisers to help the Kabila government. In reply, Congolese Tutsi militia leader Nkunda declared that "If they come in and fight... I am ready to fight them". There is a compelling blog on the web site of Congo's now-abandoned Virunga National Park, culminating with this post on 26 October, in which the 50-odd rangers were forced into the forests to run for their lives toward the relative safety of Goma. Aid agency Caritas International has a blog from Goma, last post 10 November, in German, or translated by Google into English. And for revealing, if depressing background, read Johann Hari in the Independent. There are an estimated 700+ mountain gorillas left on the planet, and at risk in this conflict, on the sides of the Virunga Mountains that form a portion of the Uganda, Rwanda and Congo borders. See our Mountain Gorilla Gallery and Rwanda Gallery on EarthPhotos.com. Glad to Have Seen It. Glad to Leave. Pertinent to the previous post, and worth a read, is today's Ask the Pilot column by Patrick Smith in Salon. Smith visited a slum south of Dakar, Senegal, and wrote, "In the end I was glad to have seen it. And I was just as glad to leave." Know what he means. A couple of places come to mind where I've thought the same thing. Pictures after the jump. Blog Action Day '08 was Wednesday. This year's theme: Poverty. Here are some photos from Digital Photography School. Because we recently mentioned Paul Theroux in a CS&W post, I note that he wrote this editorial in the Los Angeles Times over the weekend. We live adjacent to Brasstown Bald mountain, Georgia's tallest at 4784 feet (1458 meters). There a live stream from a camera on its peak here. 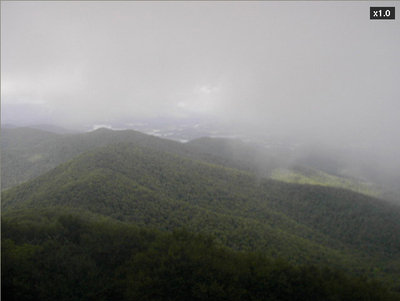 Today, 12 September, 2008, when this picture was taken, as you can see clouds tease the top of the Bald. The view is north and you can see Lake Chatuge, and North Carolina beyond. Follow the ridge line in the left of the photo away from the camera until it curves to the left, and we're over there somewhere not far out of the frame. From View From the Wing: Apparently you can use Delta Miles for Free Hair Loss Consultation. This marks Common Sense and Whiskey's 100th post. The first came nearly two months ago, on the 24th of May. Thank you for spending some time here. We hope you've found - and will continue to find - something useful, informative or pleasing here once in a while. Suggestions are welcome. And please come back. Flying is Everybody's Favorite Thing to Hate. Including Airline Employees. A pep talk for people in the airline industry from flight attendant and author James Wysong helps you realize that airline travel could be worse. It could be your job. Via Tripso.